Completed means they have actually completed the grade that year. So, if a child completed 2 grade they can’t attend JYF, but must attend Beginners. This year the CCIW Disciples 2018 Summer Camping Program has made the choice to do most of its registration with an online system. The Sections below explain the functionality of this new system. The image to the Right is clickable with descriptions. 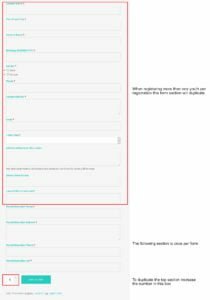 The online form is separated into different sections. This section will duplicate to match the number of youth you select for attendance on the form. This information only needs to get filled out once for each form that you submit and can be matched with any number of youth of the family attending the camp. The insurance section will not be on the Pilgrim Park Registration as their system needs a paper form. This option will increase the number of Youth information fields that are on the form. 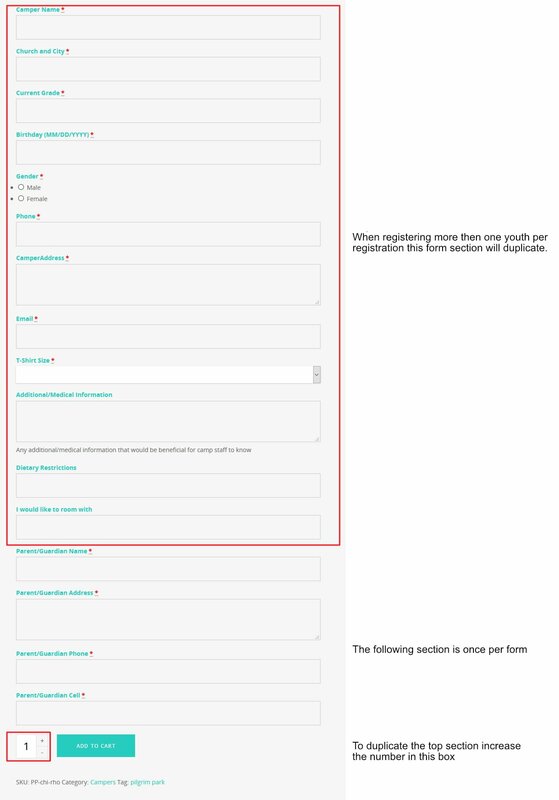 To help with the flow of filling out the form we recommend selecting the number of youth that will be attending from your family at the start of the form. After you fill out all the youth information you will have to fill out the insurance information on the digital form if you are attending a camp at Camp Walter Scott. Pilgrim Park unlike Camp Walter Scott requires a paper release and insurance form. After you register for a Pilgrim Park camp your confirmation email will include a PDF document for you to print out and sign for each youth you registered for the camp. There are a few options to allow churches to collect money to pay for the youth they are sending to camp. The method we recommend is having each family fill out the forms for their youth to attend and bring the email with their Order number and Confirmation with them to the church for the church to write a check. Family 1: Registers 1 youth for camp. Family 2: Registers 1 youth for 2 different camps. Both families bring their order number and confirmation to the church. The Church can then send a check with just the Order numbers that the check is to be assigned to. Once the check is received we will mark the order that was placed as Hold -> Completed which will send a confirmation email to the family that placed the registration. *A full refund (minus the processing/program fee) will be made if cancellation is received two weeks prior to the event. **A partial refund will be made if extreme circumstances (e.g. accidents, illness, family death) make it necessary for the camper/conferee to leave after the event has begun. The remaining amount will be pro-rated according to the number of days the participant must miss.